NOTE: You are purchasing a standalone product; MyWritingLab™ does not come packaged with this content. If you would like to purchase both the physical text and MyWritingLab, search for ISBN -10: 0133969894 / ISBN-13: 9780133969894 . That package includes ISBN -10: 0321984250 / ISBN-13: 9780321984258 and ISBN -10: 0133933296 / ISBN-13: 9780133933291. MyWritingLab should only be purchased when required by an instructor. For courses in Writing Across the Curriculum or Writing About Biology. Teaching biology and strong writing skills simultaneously is a challenge, especially when students exhibit a range of abilities. The Ninth Edition of A Short Guide to Writing about Biology provides tools to strengthen student writing and reinforce critical thinking. 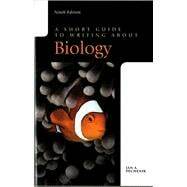 Written by a prominent biologist, this best-selling guide teaches students to express ideas clearly and concisely. It emphasizes writing as a way of examining, evaluating, and refining ideas: students learn to read critically, study, evaluate and report data, and communicate with clarity. Using a narrative style, the text is its own example of good analytical writing. In this new edition, students learn how to avoid plagiarism (Ch 1 and 3), read and interpret data (Ch 3, 4 and 9), prepare effective Materials and Methods sections in research reports and more (Ch 9), and prepare manuscripts for submission (Ch 9). The text also provides advice on locating useful sources (Ch 2), maintaining laboratory and field notebooks (Ch 9), communicating with different audiences (Ch 6 and 10), and crafting research proposals (Ch 10), poster presentations (Ch 11), and letters of application (Ch 12). This title is also available with MyWritingLab — an online homework, tutorial, and assessment program that provides engaging experiences for teaching and learning. Flexible and easily customizable, MyWritingLab helps improve students’ writing through context-based learning. Whether through self-study or instructor-led learning, MyWritingLab supports and complements course work. What Do Biologists Write About, and Why? Prelude: Why Are You Writing Papers and Proposals and Giving Talks?